Although I'm slightly gutted that the first of March didn't bring more sunny weather to get me in the mood for Spring, the past snowy days have meant that I've made the most of my warm bath, steaming hot drinks and lots of 'snowed in' snacks. I wanted to share with you my self-care routine that I've been participating in whilst the weather has been snowy and chilly. I've ben getting back into reading a lot lately and although I'm yet to finish The Muse, I have been eyeing up my next read, Joe Lycett's Parsnips, Buttered. I'm not usually one to read anything non-fiction, but I was tempted in by Joe being one of my favourite comedians. 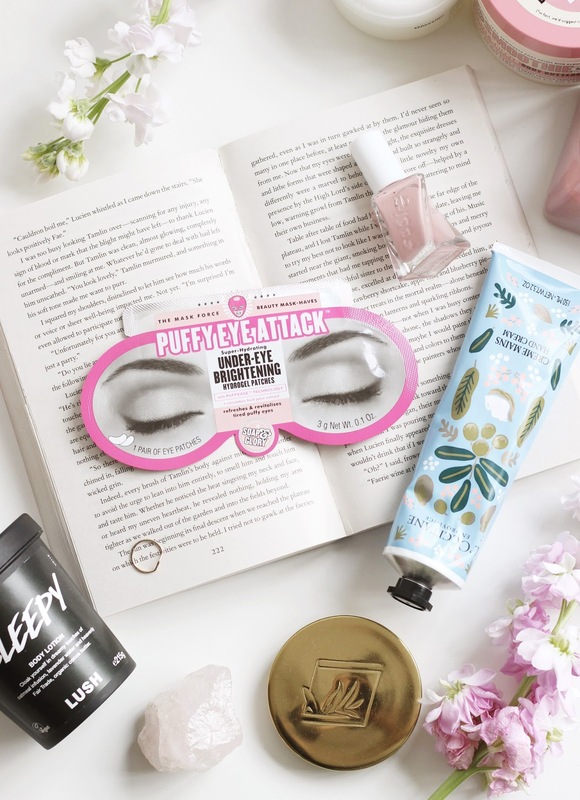 I was recently sent a generous amount of Soap and Glory treats and in it I was exited to see the Puffy Eye Attack Patches* which I've already used. They cooled my eyes and made me look a little less puffy after a night of bad sleep which was great; I would say though that you need to make sure you have the spongy side against the skin, as the rougher side is a little irritating to the eye area. For a face mask, I've been loving the Origins Drink Up Intensive Mask as it delivers a great deal of moisture to the skin, soothing and calming as it goes. It's great when you want to really give your skin a boost too, as you can leave it long for pretty much as long as you'd like or until your skin has drank it all up. I've been slathering on my Lush Sleepy Body Lotion because, as I previously mentioned, I haven't had the best nights sleep recently and the dreamy lavender scent helps me to doze off after reading. I have been trying out the Soap and Glory Smoothie Star Buttercream* for the last couple of days and although it's far too soon to say whether I like the formula or not, the smell is just everything! It's almondy-vanillary goodness sinks in to the skin and lingers on the body (and the room!) for a little while and it smells good enough to eat. As for a bath, I've swayed away from my usual Lush baths again and have delved back into the abundance of other bubble inducing products I have on offer. Lighting a few candles and having a few minutes to yourself definitely helps me to unwind. When I feel a little stressed, I love to make lists as they help to clear my mind and when I'm stuck indoors on a snowy day, then even doing the tasks that you've been putting off for a while (like clearing out your laptop!) is satisfying in the end. After the bath, there's nothing quite like slipping into warmed up PJ's and fresh bedding; it's the little things that put a smile on my face at the end of the day. With a favourite box set and hot drink in hand, I'm set for the rest of the night! What's your self care routine at the moment?